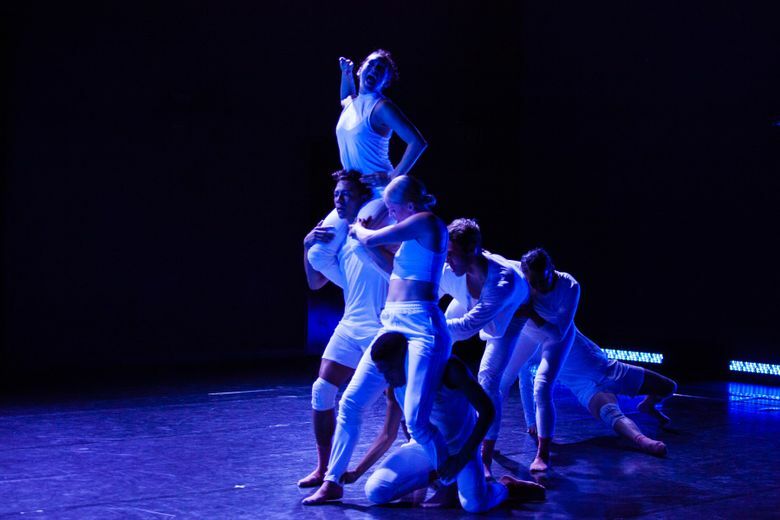 Works from three different choreographers chosen by Whim W’Him dancers offer both social commentary and visual delights. As you wait for Whim W’Him’s latest show to start in the Erickson Theatre, a robotic GPS female voice starts issuing driving directions over the public-address system. A technical glitch? Someone’s idea of a practical joke? This is the opening of Portuguese choreographer Bruno Roque’s “The Background Hum of Stimuli,” one of three stellar new dance works in the latest edition of Whim W’Him’s “Choreographic Shindig.” “Shindig” is unusual in that Whim W’Him artistic director Olivier Wevers steps aside and lets his dancers choose which choreographers they want to work with. They’ve commissioned some dandy pieces in the past, but this year they’ve outdone themselves. Roque’s “Stimuli” starts the evening on a comic note as it playfully critiques our addiction to smart devices and social media. 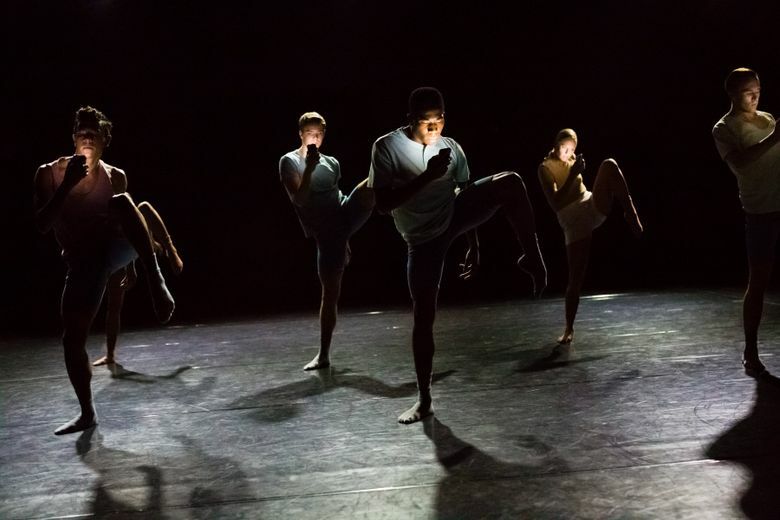 That GPS voice takes Whim W’Him’s seven dancers through some nonsensical paces (“Bounce — vigorously!”) before telling them to switch their phones off and immerse themselves in a seductive jazz score. The movement ranges from conga-line partying to quickstep elasticity. It wraps up beautifully — only to have Ms. GPS return to warn us sternly that any sense of connection and control that our smart devices give us over our lives is purely illusory. With “Summoning,” New York choreographer Adam Barruch delivers an intricate masterpiece. Props figure throughout the work. In one duet, featuring Jim Kent and Karl Watson, a bare tree-branch becomes an object of both contention and connection. In another passage, Liane Aung, Tory Peil and Adrian Hoffman perform an enigmatic rite involving a water-filled bowl, culminating in the two women forcibly manipulating a strangely passive Hoffman. The communications in these exchanges can be as tender as they are complexly abstract. Each finger, hand and limb movement is detailed to the point where the dance feels as rich as a novella — one in which the dancers don’t just dwell on every sentence, but meticulously shape or distort each word. Nashville choreographer Banning Bouldin’s “Limitation Etudes: 7-10” is just as involving. Choreographed collaboratively with the dancers, it takes four different approaches to movement constraint. In one scene, white elastic bands connect Mia Monteabaro’s hands and feet, creating strange, rubbery geometries as she ties herself in knots. Other dancers, similarly restricted, join her one by one, until they all resemble self-activated marionettes. Later, Aung is the odd woman out, sometimes alienated from and sometimes supported by her fellow performers. The piece’s theatricality and technical prowess combine to perfect effect. The closing image of a straitjacketed Aung being gently carried into darkness is a stunner. For the 2018 edition of “Shindig, three choreographers from Chicago, Puerto Rico and Spain have already been selected from 150 applicants. Those fierce odds make plain how exacting the standards for “Shindig” now are.